Is equipment and locker storage available at ESPN Wide World of Sports Complex? 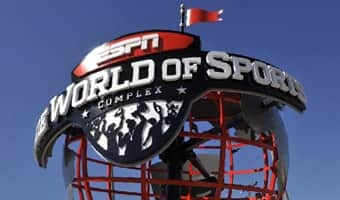 A Shower, locker room and storage facilities are available at ESPN Wide World of Sports Complex, however they are not available for all competitions, events and functions. To learn whether your team is eligible to utilize these facilities during your visit, please contact your designated event manager. Are strollers allowed at ESPN Wide World of Sports Complex? 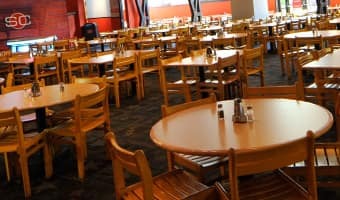 A Strollers are allowed inside the ESPN Wide World of Sports Complex, however, for the safety of our guests, they are prohibited inside the VISA Athletic Center and HP Field House. Designated stroller parking is available outside the venues. There are no stroller rental locations on site. Are wheelchairs available at ESPN Wide World of Sports Complex? A Wheelchairs are available for rent to guests requiring assistance. Wheelchairs are available on a first-come, first-serve basis. Wheelchairs may not be reserved and quantities are limited. Pickup and drop off location is at the ESPN Clubhouse Shop located near the Box Office. Daily price: $12.00 (with $100 refundable deposit). Are there public restrooms at ESPN Wide World of Sports Complex? A Yes, restroom facilities are available at all competition venues at the Complex. For locations of restrooms, please inquire with a Cast Member or check the official ESPN Wide World of Sports guide map, available throughout the complex. Does ESPN Wide World of Sports Complex have an on-site response team for handling medical emergencies? What other medical assistance is available? A Yes, during events, athletic trainers, provided by Select Physical Therapy, are present at the Complex and are able to respond to athlete injuries. Athletic trainers, provided by Select Physical Therapy, also may be available for preventative taping pre-event, subject to availability and other restrictions. Automated External Defibrillators (AEDs) are available at ESPN Wide World of Sports Complex, as well as the Walt Disney World® Resort. AEDs can be used by any Cast Member, or guest, in response to a cardiac emergency. No training or certification is required, as the device will prompt the user with step-by-step verbal instructions. See your official ESPN Wide World of Sports guide map for icons denoting AED locations. Are there laundry facilities located at ESPN Wide World of Sports Complex? 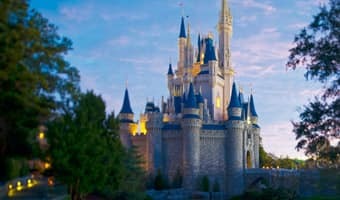 A Laundry facilities are not currently available at the complex; however, Walt Disney World Resort hotels offer self-service laundry facilities, plus dry cleaning and valet laundry services.